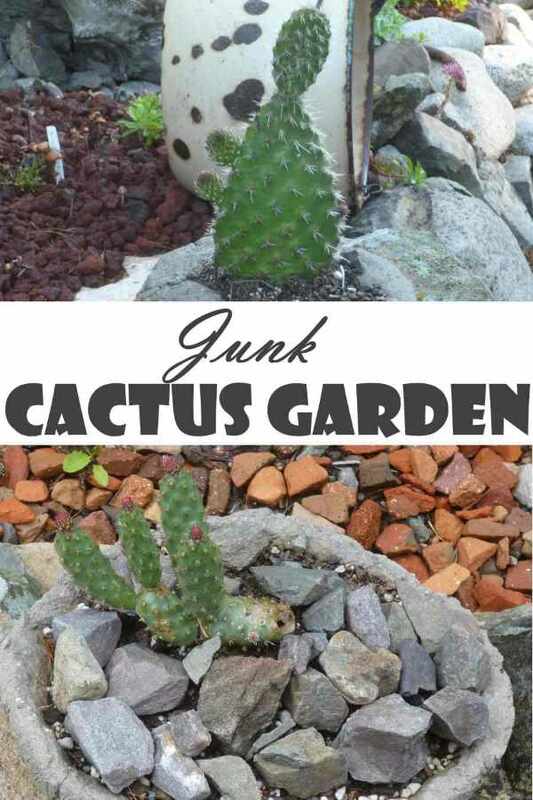 Junk Cactus Garden; protect those spiky cacti; or is it vice versa? The hardy cacti that I've started to collect need a safe place away from the dog - or is it the other way around? 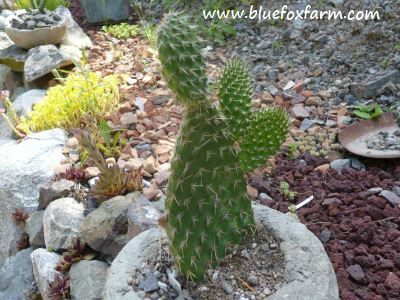 I've had a lot of fun planting all the cactus pads that I got from a couple of equally fascinated friends. Each pad as it rooted got a special hypertufa pot, and overwintered quite happily in them, but I can see that these won't be big enough for them. Eventually, they'll need more room; where better to put them but on Boot Hill, a specially designed and built garden just for the cacti - safely behind a fence. See more about the plants and how to plant them on the other site, Drought Smart Plants. 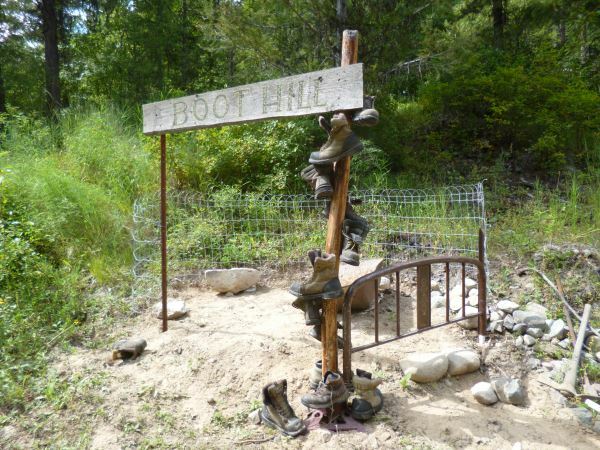 The boots of Boot Hill are all spiraling up a pole, which is one side of the gate, which you'll probably recognize as an old time bed frame. The other end of the bed frame is part of the fence, while the rest of it is thick wire type fence, exactly what's needed to keep animals at bay. In the old wheelbarrow, there are several shovel blades, arranged in a spiral - just like one of my favorite Sempervivum, or an exotic flower. Happy and healthy, the cactus seem to really like hypertufa; who would have guessed? 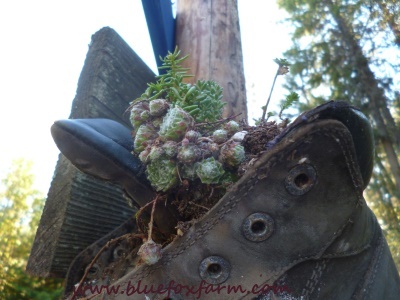 Other treats are the boots filled with Sedum and the odd Sempervivum, rustic stone steps, and the collection of hypertufa pots with the cacti growing in them. 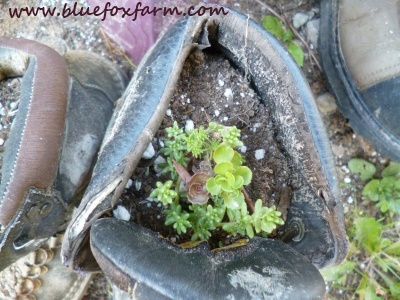 In time, they will be repotted into some rusty galvanized buckets, or into more raised planters like the wheelbarrow. The soil I use for these kinds of plantings is one with a water retaining polymer. This makes them so much easier to water, because it just soaks it up, instead of it all running out. 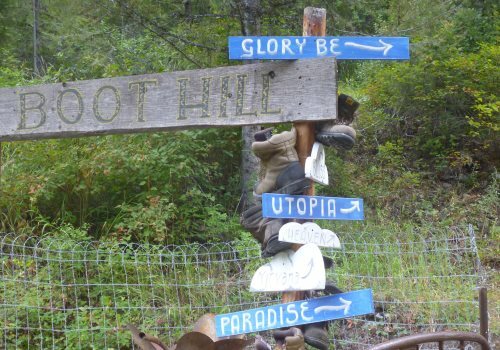 Pointing to heavenly retreats, like Glory Be, Utopia, Paradise and the Earthly Eden the hand painted rustic signs help the miners souls find their destination; or if you prefer, the way to their gold and silver mines, long abandoned. 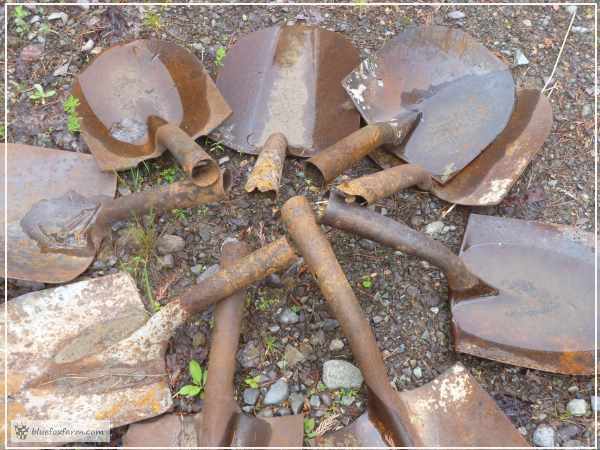 Another part of the collection is lots of worn out shovels - after all, this is mining country, after all. One day, they'll be welded together to form a rosette. Pickaxes are commonly used for mining, so there's a selection of those too, and pitch forks, rusty and without handles to accent the fence.